The dragon has been asleep for many long years. In that time, the cave under which it slumbered has changed greatly… Goblins and strange monsters have filled its gloomy depths and there are whispers that the cave itself has begun thinking, shifting and growing ever more dangerous. Still, stories of peril rarely overshadow rumours of riches, and indeed, riches there may be… For where a dragon slumbers, there also lies a fiercely guarded treasure. Fortunately for the slumbering beast, malevolent crystals fill the cave’s rooms with spectral light, hiding the entrance to the immeasurable treasure trove. Many have given their lives to the search and over the years, the rumours have faded to legend. But the most courageous adventurers will not be discouraged by bloodshed. On this day, a knight steps into the darkness, her gloved hand gripping the hilt of her sword. Her years of quests — all of the victories and defeats — have led to this one final adventure. Knowing the kingdom can never truly be at peace with the dragon beneath the cave, she has come to make a final stand. Little does she know that she will awake everything that slumbers in the shadows… and begin the final battle in the darkness. Vast takes the simple enough idea of having asymmetric player roles to unusual lengths, yet somehow it manages to remain both highly interactive and generally very well balanced. 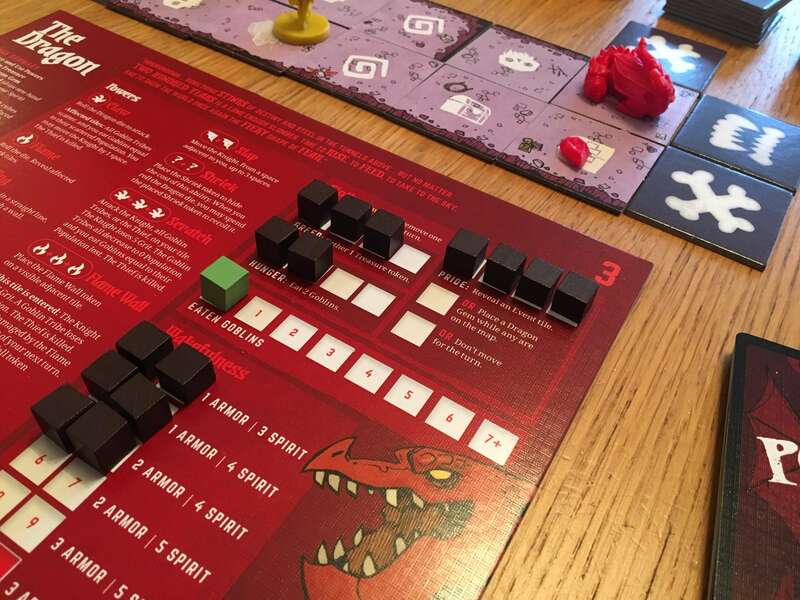 The base game supports up to five players, but included in this review I’ll also be covering the Fearsome Foes expansion, which potentially increases that player count further. I’m also using a miniatures expansion and a deck of bonus cards, but I’ll explain more about that in the components section. In Vast, each player controls a character or faction that is either invading, living in or escaping from a cave. 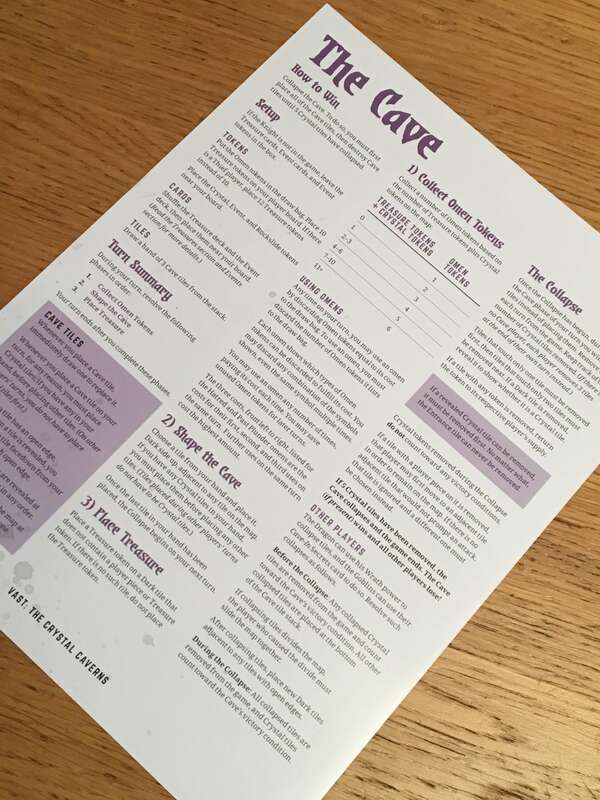 The cave itself is a playable role which acts a bit like a DM in the traditional sense, though in Vast there’s a bit more structure and direction. In the base game, players can choose from more or less any combination of The Knight, The Dragon, The Goblin Tribes, The Cave and The Thief, with various victory conditions applied to each eligible combination. So far this probably sounds pretty standard, but it’s the variable victory conditions and how to achieve them that really differentiate Vast from pretty much every other game. Take The Knight and The Dragon, for example. 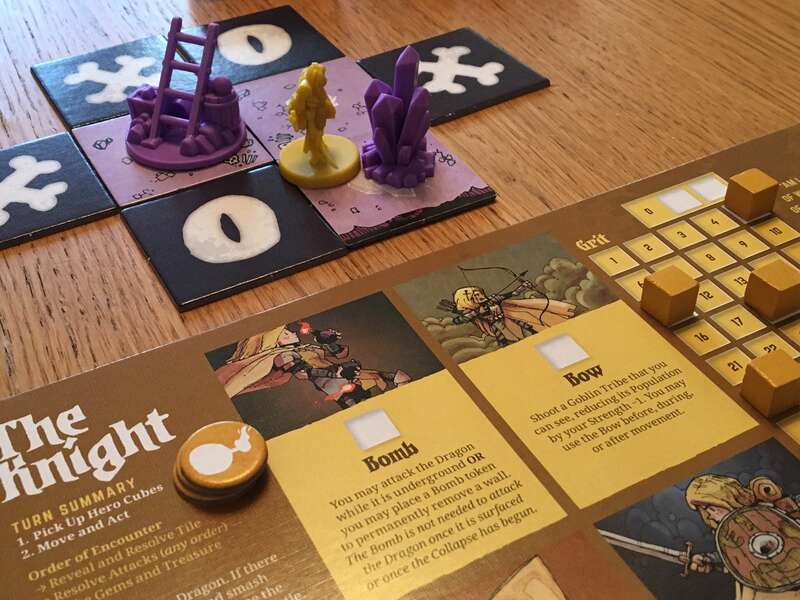 In the standard game, The Knight wants to slay The Dragon, but to do so she’ll first need to gain grit (experience) to increase her strength and skills by fighting goblins and exploring The Cave. The Dragon, meanwhile, just wants to escape, but she’s too sleepy. She needs to eat goblins to increase her wakefulness and increase her power, then head to the exit. The Cave itself simply wants to crush everyone. To do so, it must expand fully before collapsing inwards one turn at a time. As this expansion happens, The Cave player will be given certain resources which allow them to place traps and other hazards to hamper the other players — usually based on whoever is closest to achieving their victory condition. The Fearsome Foes expansion includes several new creatures to add to the mix, each with unique objectives and abilities that layer in additional interest — and complexity. Even considering just the base game, Vast is a very generous box of tricks. With the miniatures expansion and the Fearsome Foes, it’s even more incredible. The board itself is made of individual sections of cave which feature stylised artwork. Players can choose to explore the cave with either wooden pieces or standees, with the miniatures expansion unsurprisingly adding the third choice to take a very well-crafted plastic piece. Everyone receives a unique player board, featuring tonnes of information about their character and how to progress them. 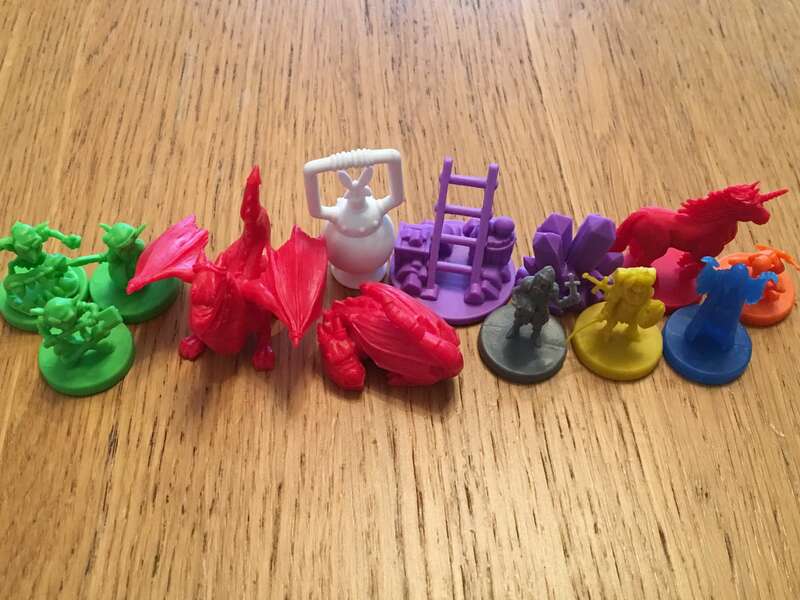 With their board, each character will likely receive a number of wooden tokens (ranging from a few to an absolute tonne) which are placed onto their board as trackers for various things. The character setup boards are lovely to look at, but because they have no indentation, pieces can move on them if knocked. The game also features several decks of cards, all of which feature artwork that ties in with the rest of the game and brings it to life. The Goblins have war and monster cards, The Dragon has power cards, The Knight has side quests to complete etc. Of particular note to anyone interested in the Miniatures Expansion will be the treasure chests, crystals and other supporting pieces it contains, which really help to bring the game to life. There’s an excellent player guide for each role and the manual itself is glossy and filled with colour. When all is said and done, Vast feels like a very comprehensive package that is really nicely presented. A lot of design effort has clearly been placed into the game itself, but beyond that, everything is brought together visually and thematically by the components, which are fantastically done overall. When it comes to actually playing the game, Vast can polarize opinion. I don’t think anyone will be in doubt about how powerful the game system it is, but it can be very daunting to teach and to learn. This, largely, is because every role in the game is completely unique, with different objectives and capabilities, most of which change during the game. On the first turn, for example, The Knight simply has a couple of actions to take. She’ll normally move and explore to lay out more of the dungeon. Later in the game, she’ll unlock more actions to spend and the variety of options available to her will expand as well. She also has a number of unique interactions available to her depending on the foe she might be facing, as well. The Dragon begins the game in a reduced, slumbering state. This is represented by a crouching miniature/standee/meeple which is replaced by another at a certain level of wakefulness. To reach this stage of their development, The Dragon must consume the goblin pieces that spawn on the board. Where The Goblins are concerned, the player must manage three separate hordes who need to gain strength (rage) to be combat effective, but can become unruly and ultimately disband at certain sizes. Each of these hordes has abilities and specialties of its own. There’s The Cave and The Thief in the base game as well, so a five-player game is a lengthy teach. 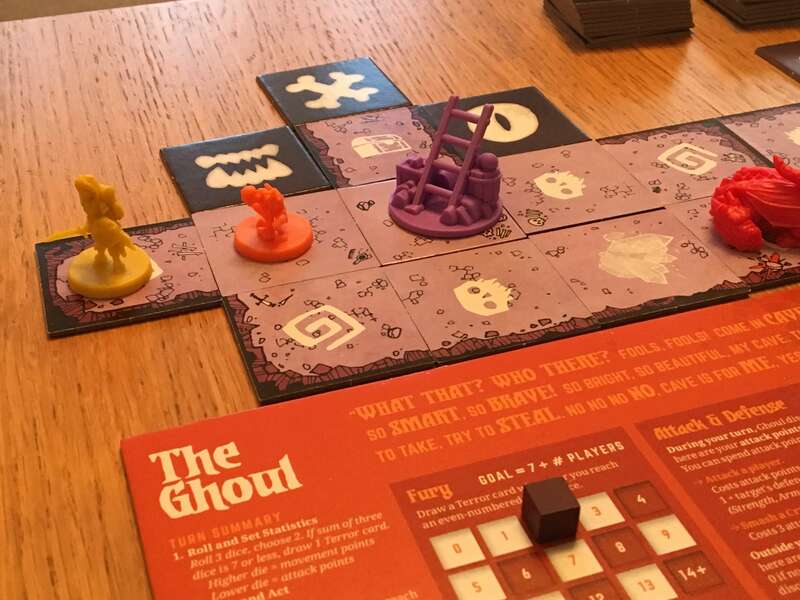 You’ll probably be fully committed to Vast before investing in the Fearsome Foes expansion, but if you do, you’ll get three more basic miniatures (a ghost, a ghoul and a nightmare unicorn), all of which have several variants for in-game play. Experienced players will have no problem accommodating these new characters, but it’s unwise to jump straight into one on even your fourth or fifth play of the game. Whilst I’m not going to go into detail about these roles any more than I have, I will say this: once you’ve learned the roles and you understand what each is capable of (and at least one player understands them all to check and balance), Vast plays quickly. There are many actions available, but they all make sense and the feeling of descending into an ever more threatening cave filled with danger is constant — and exciting! I may have hinted at this already, but Vast is a touch daunting and quite a lengthy teach. That said, it is very, very rewarding when you get there. The best way to bring everyone up to speed is probably by laying out the basic objectives for each role and diving straight in with a few guided turns. You could then either reset and play a learning game or just keep going whilst giving everyone advice — either way, at least one person needs to know the game reasonably intricately. The main lesson is not to try teaching it whilst learning it at the same time — I speak from experience. Once it is underway however, there is lots to enjoy about Vast. For starters, the asymmetric nature of the characters is fantastic. It brings an additional and very tangible extra dimension to immersion. The differences between characters are much, much more than just a painted-on theme that offers a few special abilities. In Vast, playing a different character is like playing a different game and there are enough possible variations to keep fans occupied for an age. It takes about sixty to ninety minutes to play a game of Vast, assuming no one needs to be taught. It can stretch on longer if you decide to include some of the additional elements like terrain, or use the extra cards from the bonus deck. With five players, it will clearly last longer than with two, but in any event, turns flow pretty quickly once things get moving. There’s an absolute tonne of interaction in Vast, which players will either love or hate. You’re going to have to try to attack, kill, rob or cheat each other not just to gain an edge, but sometimes because that is the entire purpose of your character. Even so, the game has little player exclusion. The Knight must damage The Dragon repeatedly, whilst goblins are wholly expendable and their power and presence ebbs and flows continuously. 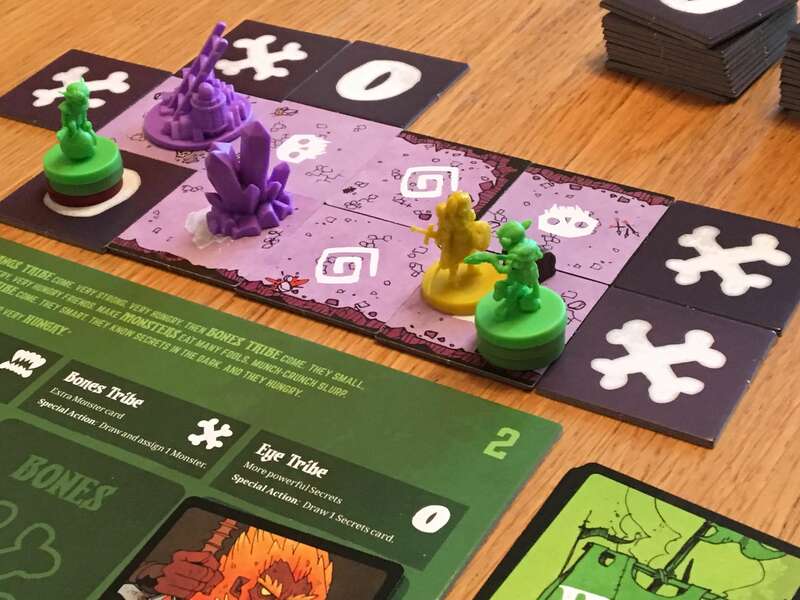 I have probably made some of my conclusions clear throughout this review, but to summarise them simply I’d have to say that I think Vast is exciting, unique and hugely innovative, whilst also being a little too demanding for some. 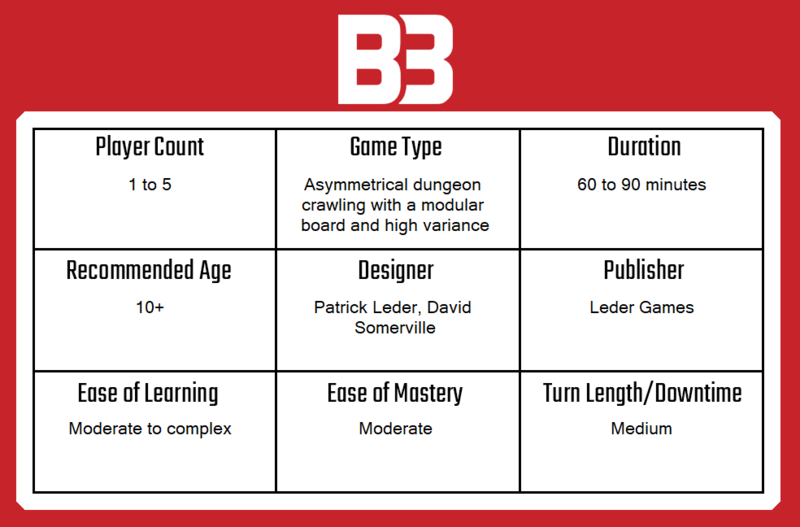 Even so, anyone who has played a medium or heavy Eurogame or even a complex dungeon crawler like Descent is going to be fine here if they take the time to understand the different roles. Whatever your level of gaming experience, Vast is a very rewarding game to play, with very close to unlimited replayability and variation. It can be complex and unbalanced, but in this rare case, that’s actually part of the appeal rather than a reason to be cautious. Whilst I have a few of the expansions, I know that others are still in the pipeline, which makes me hopeful that Vast will continue to grow and expand. Built around a superb system unlike any other, Vast is a worthwhile addition to any collection and certainly one to watch. A copy of Vast: The Crystal Caverns and several add-on packs were provided for review purposes. You can find out more information about Vast, or even purchase the game, on the website of publisher Leder Games.